What Is the Junk Drink Crisis? What Are The California Endowment and Our Partners Doing? Junk Drinks like Coca-Cola, Pepsi, Dr. Pepper and hundreds of others are made up of little more than liquid fructose, one of the most dangerous legal food substances on the market today. Unlike even a Snickers bar, which can take hours to digest, the human body absorbs liquid sugar in minutes, overwhelming the liver, which converts the sugar right into fat. What happens next? Fatty liver disease, a leading cause of diabetes. The human body is simply not designed to digest the amount of liquid sugar in a bottle of soda. So the body succumbs to disease. We’re not only talking about people who drink Super Big Gulps. Just one junk drink bottle a day can dramatically increase the risk of being overweight or developing diabetes. And for kids who drink just one junk drink a day, their risk of becoming overweight jumps to more than 50 percent. If you think that’s bad news, think about this: According to market research, the average teenage male drinks 868 cans of soda a year. The risks are even higher for people of color. More than half of Latinos and African-American women born in the last decade will develop type-2 diabetes. Where has all of this led us? More than 1 in 10 Californians have diabetes today, triple the number during the mid-1980s, when junk drink consumption was half of what it is today. And things are only getting worse. One in three children born after 2000 is projected to have diabetes and nearly half of all children of color will get diabetes at some point in their lives. The bottom line: Junk drinks alone are making millions of Californians, especially kids, sick. Just like at Big Oil and Big Tobacco, a lot of people are making billions of dollars by making our families, our state and our nation sick. Who are these people? Most of them are at The Coca-Cola Company, PepsiCo, and the Dr Pepper Snapple Group. Together, Big Soda uses their incredible wealth and marketing savvy to convince consumers that junk drinks will make them cool and popular. Does all this sound familiar? Big tobacco did the same thing for decades. The bottom line: it’s hard to compete with soda companies who can afford to run Superbowl commercials and fund campaigns designed to kill health measures that would protect the health of our kids. 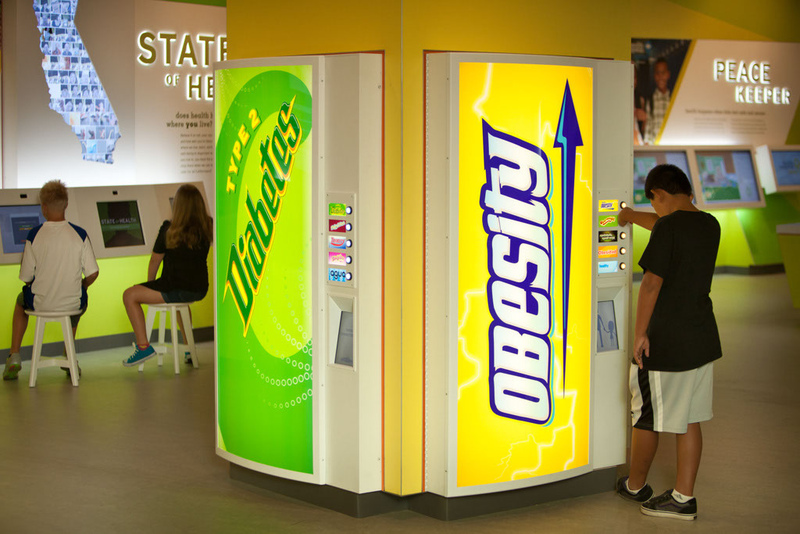 Big Soda knows parents wants healthy alternatives to junk drinks. And just guess who owns Minute Maid? Coca-Cola. Think Minute Maid’s Orangeade is a healthy alternative to Coke? Think again: An 12-ounce glass has more calories (160) than a 12-ounce can of Coke (140 calories), and 3 more grams of sugar (42). What could be better for you than Vitamin Water? A lot of things, as it turns out. This junk drink is basically repackaged, watered down Kool-Aid with some vitamins added to the 120 calories and 31 grams of sugar in each bottle. And then there’s Gatorade, PepsiCo’s “healthy lifestyle” beverage that has become synonymous with athleticism. It’s the official drink of the major professional sports leagues. But this dressed up liquid sugar has 130 calories and 34 grams of sugar per serving. Maybe if you have the metabolism of Serena Williams or Dwayne Wade, you can burn off all that junk. The healthiest drink, of course, is water, and there are other alternatives. Check the label, count the calories, and avoid products loaded with sugar. The bottom line: Junk drinks are junk drinks, even when they hide inside “healthy” packaging and marketing. Water is the most popular drink in the United States and the healthiest drink of all. But believe it or not, some California schools don’t even provide it to students. And in too many communities, it is easier to buy a junk drink than it is to drink water. Both state and federal laws require schools in California to provide access to clean drinking water, but loopholes and infrequent audits make for lax enforcement. The result? Drinking fountains in our elementary, middle and high schools are often broken or located far from school cafeterias and other eating areas. Just see what Jamie Oliver has to say. The result? Junk drinks are the norm — in and out of our schools. The California Endowment’s Agua4All campaign is helping to spread the word about the need to get water into our schools and communities. The bottom line: The least we can do is clean up and fix water fountains and cafeterias. We can do our part by joining the Agua4All campaign. The movement to take on Big Tobacco has roots in California, where our propensity for healthy lifestyles helped lead to a confrontation with the smoking culture. Now we have to lead the fight to get rid of junk drinks that are making us famous for obesity and diabetes. A warning label on junk drinks. A warning label will provide a direct message about the health risks of Junk Drinks at the most important moment of all: when consumers are making the decision about what to buy to quench their thirst. A statewide soda tax. Berkeley was the first jurisdiction in the nation to pass a soda tax. In fact, Mexico was the first nation to enact a soda tax. More state and local junk drink taxes will help discourage consumption and help balance out the health costs associated with these beverages. End taxpayer subsidy of the junk drink crisis. Recipients of CalFresh, the state’s food stamp program, as well as thousands of state employees, use taxpayer money to purchase junk drinks that hit our tax bill once again with outsized health spending. CalFresh recipients themselves are among the biggest supporters of a change in policy. Follow @drinkdiabetes on Twitter. Social media has the power to spark revolutions in our culture and even in entire nations. Follow @drinkdiabetes to stay informed and make your voice heard. And the @bigpicture campaign is a great way to share images on Instagram. Let Young People Lead. Campaigns like Youth Speaks’ The Bigger Picture are putting young people front and center in the fight against Big Soda, from innovative music videos to innovative ways for young people to take action. If you’re a young person, get involved and if you’re a parent, uncle, aunt or mentor, get the young people in your life to engage. Make smart choices. It’s pretty simple. Stop drinking junk drinks and stop buying them for your family. The bottom line: If Big Soda is marketing Junk Drinks in your neighborhood, if your school’s water fountains are broken, if your community’s effort to tax junk drinks is stumbling in the face of outright lies, then speak out. Tell your neighbors, tell your principal, tell your local officials. The California Endowment is finding innovative new ways to help educate the public. We are providing grants to organizations that are doing amazing work in taking on Big Soda and working closely with partners in California and across the country. Canzilla! There’s one great way to take on the tidal wave of Big Soda marketing: marketing of our own. Canzilla is taking California by storm with young people leading the way. This oversized balloon parody of Big Soda was even picked up by the Mexican government. Taking on Big Soda. We have been on the pages of California and America’s leading publications educating about a Junk Drink ban, fighting to end taxpayer subsidies of junk food and more. Fighting online. From @drinkdiabetes on Twitter to @bigpicture on Instagram, we are working with our partners and grantees across the state to tell the story of Big Soda to more and more people. 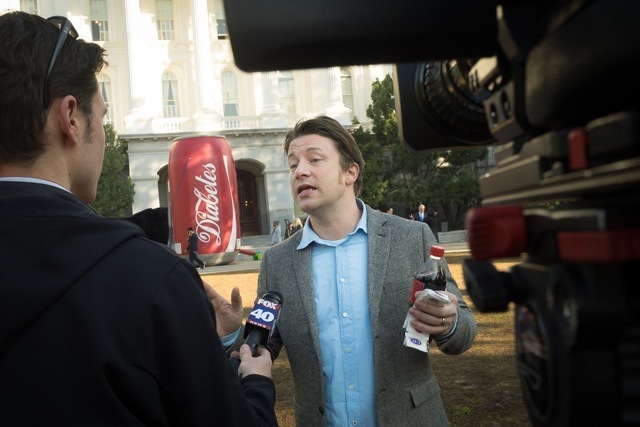 We even helped organize a Reddit AMA (Ask Me Anything) with food celebrities Jamie Oliver, Ann Cooper and Alice Waters, where the trio discussed the challenge of confronting Big Soda. Going into our neighborhoods. We are raising awareness of the harm of junk drinks to our children’s health, making fresh potable water available to all Californians and elevating the voices of young people in the discussion about how to make healthy drink choices. In Our Schools. Our kids spend about 1,000 hours a year at school. That’s why we’re supporting school food service directors to make sure they have the training and equipment they need to provide healthy and appealing school beverages, promoting innovative ideas for making water available in schools, such as installing modern water stations, and educating students about the risks of junk drinks.